Comments: Silvery metallic columnar suredaite in matrix. Location: Pirquitas Mine, Jujuy, Argentina. Scale: See Photo. 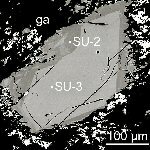 Comments: BSE image of a large zoned crystal of suredaite, chemically SU-3, surrounded (replaced) by SU-2. White is skeletal galena. (AmMin 85:1068). Location: Pirquitas Ag-Sn deposit (Province Jujuy, NW-Argentina). Scale: See Image.